Updated 10/10/17 - Corrected typos. Clarified DIR-878 operation & added DD-WRT support note. Four stream AC2600/AC3150 routers would be the new three-stream AC1900 by now if it weren't for their higher prices. Although there are bargains to be had, the cost of that extra stream and the additional performance it brings is generally around 50 bucks more. This is enough to stop the more frugal among us from making the leap. As it did with its EXO AC1900, D-Link is playing the lower-cost card with the DIR-882 AC2600 MU-MIMO Wi-Fi Router to win over buyers. To achieve that lower cost, D-Link turned to a lower-cost Taiwanese chipmaker, MediaTek for the heart that beats beneath the 882's black plastic shell. Unlike the DIR-879, D-Link didn't omit USB ports to save cost, instead endowing the 882 with one each USB 2.0 and 3.0 flavors. D-Link didn't omit front panel LEDs either, as the callout diagram below shows. The rear panel view, however, shows D-Link didn't splurge and add link/activity lights for the four LAN and one WAN gigabit Ethernet ports. But they did provide power, Wi-Fi on/off and WPS buttons, albeit teeny-tiny ones. The black plastic case has plenty of ventilation holes on top and bottom cover. Two screw mounting slots are on the router bottom that will point connectors upward in a wall mount scenario. As noted, the key to the DIR-882's lower cost is its MediaTek-based design. The fuzzy FCC photo shows how the four external dual-band antennas are hardwired to the board. The board top photo with RF can tops removed provides the first confirmation of the 882's MediaTek core. "Despite being labeled as an AC1900 router, this device appears to be identical to the AC2600 D-Link DIR-882 rev A1 aside from the USB ports. D-Link claims only 1300/600Mbps speeds but also claims that it supports four streams. The hardware is capable of four streams. FCC test reports show four-stream speeds so that's what we'll go with for specs." I downloaded the 878's internal photos and test reports and confirmed WikiDevi's assessment. Both board photos show the same "AP-MTKH7-0002 REV1.0" marking. I asked D-Link if the 878's link rates have been limited to AC1900 operation and will update when I find out. D-Link says: "The DIR-878 and DIR-882 share the same platform, and the DIR-878 can function at AC2600 speeds." They also want you to know both support DD-WRT. The board bottom is pretty clean except for the flash and a thermal pad for additional heat dissipation. Table 1 compares the DIR-882 with the top-rated NETGEAR R7800 Nighthawk X4S, which is based on Qualcomm silicon. The DIR-882 has D-Link's standard interface described quite some time ago in the DIR-880L review. There is no on-line emulator. It looks like D-Link has added some features missing previously. The VLAN feature in the Internet (WAN) settings looks like it was added to support service providers. You can enter a VLAN ID tag for three different VLANs, then assign Ethernet, Wi-Fi or Wi-Fi Guest connections to each zone. VPN support has been added in the form of Quick VPN, which is D-Link's moniker for an L2TP over IPsec server. This should be able to connect Windows clients that now have an L2TP over IPsec client built in. You can define only one user, however. I didn't test this feature. D-Link still hasn't added the ability to view any logging info in the admin GUI. But you can download the Linux messages file, which will look like this. You get transmit power adjustment of High (default), Medium and Low, scheduled wireless on/off, radio disables and one guest network for both radios. WPA Enterprise / RADIUS mode is not supported. WPS controls are provided for PBC (push-button, default enabled) and PIN methods (default disabled). The router defaults to "Smart Connect" enabled. This term was originally coined by Broadcom for its tri-radio routers to describe a band-steering feature that is supposed to intelligently distribute devices between radios to optimize total throughput. Since then, the term has been co-opted and applied to any routers that actively band-steer, even plain ol' two-radio ones. ...and 5 GHz defaults. Even though D-Link specs 80+80 MHz bandwidth support, it's not currently implemented. Word from D-Link HQ is that it won't be available until "early Q1 2018". Not a biggie, though, since devices that support this mode are scarce. Here are the Guest Zone settings. There are no Smart Connect controls other than the enable / disable. There are no controls to disable MU-MIMO, nor are there any to switch the 882 to act as an AP or wireless bridge. We used our standard router storage test procedure to measure file copy throughput for FAT32 and NTFS volumes connected via USB 2.0 & 3.0. All the data is in the Router Charts; I'll be comparing USB 3.0/NTFS results only. The 882 is far from the best performing product for this benchmark, landing in last place for write—with throughput about the same as seen with a USB 2.0 connection—and second from the bottom for read. The DIR-882 was loaded with 1.01B02 firmware and tested with our V10 router test process. 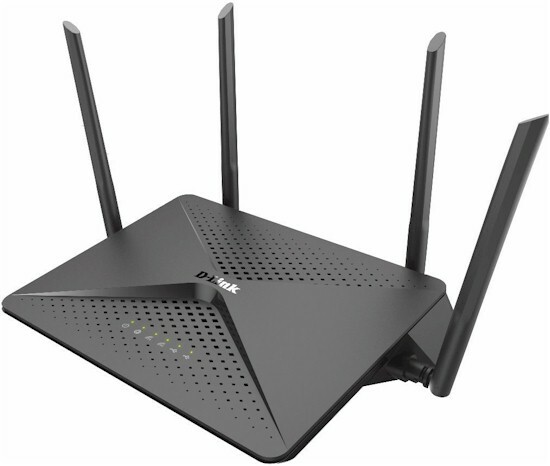 I'm comparing with the ASUS RT-AC5300 because it also is a four-stream router. D-Link and ASUS both show gigabit wirespeed routing using our simple iperf3-based test. But comparing the tougher HTTP benchmark averages slots the DIR-882 in the lower half of both charts. At least it beats both similarly-priced NETGEAR routers. Looking at a plot of the benchmarks that make up the averages above, shows the ASUS' extra processing power helps it better handle the smaller filesize benchmarks. Comparing average Bufferbloat scores shows the 882 doing comparatively well and beating the much more expensive ASUS in both directions. Converting the score values to more relatable latency yields an average downlink latency of 1.6 ms and uplink of 2.2 ms. The Cut Through Forwarding tests look for throughput reduction when various router features are used. Enabling QoS and setting the machine running the test in the highest priority slot knocked throughput down to only 37% of normal, around 235 Mbps down and 349 Mbps up. I found no other features that caused a throughput hit. The DIR-882 is not Wi-Fi Certified. It was loaded with 1.01B02 firmware and tested with the Revision 10 wireless test process . The router was reset to factory default, then set to Channel 6 and auto 20/40 MHz bandwidth for 2.4 GHz and Channel 40 and 80 MHz bandwidth for the 5 GHz radio. WPA2/AES encryption was used for all connections. The Revision 10 process still uses 20 MHz bandwidth for 2.4 GHz tests for throughput vs. range, but uses 40 MHz for peak throughput tests. These settings are enforced by the octoScope Pal test client. We'll start by comparing average throughput to get an initial feel for how the 882 measures up. It did quite well for 2.4 GHz, topping both down and uplink charts. The 5 GHz average plots show the 882 doesn't fare quite as well, moving down to the lower and middle sections of the plots at 138 Mbps downlink, 219 Mbps uplink. Moving on to the 2.4 GHz downlink throughput vs. attenuation comparison plot brings the RT-AC5300 back for the battle. The D-Link's higher chart placement is mainly due to its higher throughput with strongest signals. From 24 dB attenuation on, the two routers are evenly matched. The story is similar for the 2.4 GHz uplink plot, although the 882 maintains higher throughput throughout the entire test run. It also disconnects 12 dB later. The 5 GHz downlink profile shows the 882's significantly weaker performance. It doesn't come close to the ASUS for most of the test run. I have to admit the shape of the 882's curve is odd, with some transformation in MCS ranging occuring at the 21 dB test. But all the throughput vs. attenuation tests are the average of two test runs, so the behavior was consistent. The 5 GHz uplink plot is like looking at a completely different product, with no hitch at 21 dB. The DIR-882 does pretty well, ending up third-ranked on downlink and #1 ranked on up, with 562 Mbps and 596 Mbps, respectively. The 5 GHz peak benchmarks again show better results on uplink with 943 Mbps. Downlink was still a respectable 841 Mbps. A reminder that the 882 doesn't have a wireless bridge mode. So you'll need to pair it with a product that does if you want a high throughput Wi-Fi link. I did not test MU-MIMO. Some of the SNBForums regulars were excited when D-Link announced the DIR-882, due to its relatively low price for a four stream MU-MIMO router. Price aside, I have to say some enthusiasm is deserved based on our performance test results. The Ranker Performance summary shows its strong 2.4 GHz performance, which is counterbalanced by not-as-strong 5 GHz results. If we had an SNB award for best price performance, the DIR-882 would certainly earn it. Although Amazon is pricing it at $130 as I write this, it would still be a compelling buy at its $149.99 MSRP. So if price has been holding you back from seeing if moving up to a four stream router could give your Wi-Fi performance a boost, D-Link's DIR-882 is an inexpensive enough way to give it a shot. If you can live without USB storage sharing, you might as well save a few bucks more and get the AC2600-router-hiding-as-AC1900 DIR-878 instead.